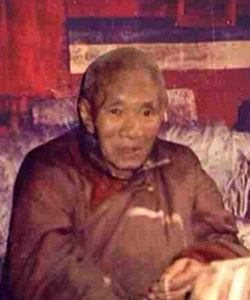 The exalted Lama Yeshe Jungne was born in 1910 (the Iron Dog Year of the 15th cycle), in Yarshi of Pewar in the district of Dege in Kham, next to the river called Drichu. His father was Chugur Lama Sonam Tseten, and his mother was called Taklog. This master, having taken refuge with Chamgon Pema Wangchuk, became a junior monk at Palpung, and received the name Yeshe Jungne. He then proceeded to learn by heart the liturgies and recitations for the twelve mandalas specific to the Karma Kamtsang tradition, and became skilled in the melodies and instruments. He then spent more than a year in the great protector shrine room in retreat. During this time (in front of a protector image made by Je Dharmakara, Situ Chökyi Jungne), each evening he would offer three hundred prostrations whilst praying again and again that he become like the Kagyu masters of old. He received ordination from Situ Pema Wangchuk and was given the name Karma Tsultrim Tsondru. He then went on to take the Bodhisattva vows of the two traditions from the two main systems; with that he received the name Karma Changchub Lodrö. He received many ripening and liberating empowerments, transmissions, and authorisations, principally for the classes of tantra of Marpa’s tradition, but also many others belonging to the New and Ancient schools. From the master Beri Khyentse he received the transmission of the liturgies and recitations for the empowerments, reading transmissions, and instructions of the twelve mandalas specific to the Karma Kamtsang tradition, as well as the reading transmission for the Kangyur (The Translated Words of the Buddha). From the second Jamgon Rinpoche he received empowerments, reading transmissions, and instructions for the Five Great Treasuries. In Palpung’s monastic college (shedra), with resolute faith and diligence, over a period of six years he completed his study of a wide variety of subjects under the tuition of Khenpo Khyenrab. He studied the root texts of the Vinaya Sutras; The Sutra of Individual Liberation and the Karika; The Vinaya Flower Garland; The Definite Excellence of The Three Vows; Six Collections of Middle-way Reasonings; higher and lower Abhidharma; the five Dharmas of Maitreya; The Ornament of Liberation by Gampopa; Nang Dag Gyu Sum*; The Three Cycles Of Light Rays; and An Oceanic Text of Valid Cognition and Reasoning. Thus he became someone praised by khenpos and students alike. Khenpo Khyenrab and the general secretary of Palpung, Gya Lama Lodrö requested that Lama Yeshe Jungne do retreat, and he duly entered the Lower Samten Choling Retreat of Palpung. Relying upon Drupon Lama Delchung Tashi Tsering by way of the three kinds of pleasing action, Lama Yeshe Jungne received all of the oral instructions for everything from the preliminaries up until the paths of method and liberation, and he completed his practice excellently. He adhered to the way of the lineage masters of old, and became the highest of his Lama’s heart-sons. From that time until his death he never lay down at all but always sat upright with crossed legs. With his right hand he constantly spun a multi-tiered prayer wheel; and in his left hand he held a mala; sitting like this he would practice unceasingly. He was always content and of little desire and would only wear mere rags for clothing. For example, he only ever owned a single pair of shoes that were given to him by Pema Wangchuk. His retreat master, (Delchung Tashi Tsering) went on to become one of the lamas to the Sixteenth Karmapa, Rigpe Dorje. Having finished the retreat, as per the tradition of Palpung, Lama Yeshe Jungne then became the monastery’s shrine master for three years. He had many wonderful lamas, such as Karmapa Rigpe Dorje, Kalu Rinpoche, Lama Chotra, Lama Norbu, and Lama Sonam Norbu. From these and other masters he received empowerments, reading transmissions, and instructions. Relying upon Lama Sonam Norbu, Lama Yeshe Jungne entered the Palpung’s middle retreat for just over a year. In this retreat he authentically practised the approach and accomplishment stages for Vairochana (of the Sarva Durgati Parishodhana Tantra), Akshobhya, Vajrasattva, among others. When Lama Sonam Norbu passed away Lama Yeshe Jungne became the retreat master of the middle retreat. He became very close to Pawo Rinpoche, who subsequently asked Lama Yeshe Jungne to become the retreat master at Nenang. Although plans were made for this, and for a pilgrimage to Lhasa and other pilgrimage sites, it never materialised, because Situ Pema Wangchuk made Lama Yeshe Jungne the retreat master for the lower retreat centre, a position he held for four consecutive retreats. In his lifetime he gave away all of his possession seven times and had countless supports of body, speech, and mind commissioned, as well as many other forms of offering. Once the situation in Tibet had changed, Lama Yeshe Jungne, due to his simple lifestyle, didn’t experience any difficulties, such as imprisonment, accusations or humiliation, or any other severe hardships. Having returned to his homeland, he ceaselessly continued to practise, just as he did when he was in the retreat centre. As the doctrine and monasteries began to be restored, he returned to his monastery of Palpung. Once there he followed the order of Tai Situ Rinpoche and Jamgon Karma Lodrö Chökyi Senge and became the retreat master. Lama Yeshe Jungne continued as the retreat master for three cycles of retreat where he bestowed all of the empowerments, reading transmissions, and instructions; and practised the stages of approach and accomplishment together with the retreatants. That is how he performed his own benefit through study, reflection, and meditation; and others benefit through the activity of the three spheres. His work temporarily complete, he passed away in 1993. Among his many students are Khenchen Tsultrim Zangpo, Khen Locho, Riwa Togden, Lama Kunzang Namgyal, Jang Drolkar Tulku, and Riwa Thubgyal Tulku. Furthermore, there are those who received empowerments and dharmic connections from him, such as Situ Pema Donyon Nyinje, the learned master Khenpo Tsenam, Khen Tsewang Rabten, and countless other such students. * Three principle texts of the Kagyu tradition: The Profound Inner Meaning, The Two Sections (Hevajra Tantra), and The Highest Continuum.